There was a scene in the award-winning film, “Hidden Figures,” where the lead character was permitted to have a job with NASA, but had to go to extreme measures to simply use the restroom. BHS Senior Vincent Pinti could relate to that issue and it was one of the many reasons he felt compelled to represent the disabled students being affected by the proposed omnibus education bill - Senat Bill 451. Born with Spinal Muscular Atrophy, Pinti uses a wheelchair at school. Both public and charter schools would be able to offer basic accommodations such as a wheelchair ramp for students with disabilities. Therefore, he would be able to technically attend either type of school. The difference is, as Pinti points out, that public education also provides an aide, therapy options, and a very supported staff who is educated in specific modifications necessary for each disabled student’s needs. Similar to the “Hidden Figures” restroom scene, simply giving someone the opportunity to have a job or get an education does not show the whole picture. For Pinti, and many other disabled students, the idea of charter schools offers no good option that promotes educational advancement to those with disabilities. A longtime advocate for the disabled, Pinti is very comfortable making public presentations. As a freshman at BHS, he won the state Voice of Democracy Speech Contest and presented in Washington D.C. In 2017, he was back on the national stage during the inauguration as part of the Envision program. Most recently, he received the Frank Taylor, Jr. Award at WV Boys State for being the best judicial scholar in the program. When the controversial omnibus bill was first introduced, the Senate did not have hearings. When the bill advanced to the House, the hearings were announced. Comments from the public were welcome and Bridgeport High School had two representatives who were livestreamed during the hearings on Monday morning. With nearly 80 speakers, time was shortened from the original three minutes to just 70 seconds. Dr. Jenny Santilli, a nationally board-certified Spanish teacher at BHS was the first to represent BHS. Her impassioned speech highlighted the many areas in which West Virginia schools excel and the extensive support services offered throughout the state through the educational system. Pinti was one of the last ones to speak. He was the only student representative at the hearing and received the only standing ovation of the day. After his speech, Santilli was quick to point out how proud she was of him. Laurel Muhley-Alexander, a BHS senior, was also in the audience supporting the speeches of both Pinti and Santiili. It was important for her to be involved in the process of advocating for public education and for those with disabilities. In addition to his speech in Charleston Monday, Pinti has been recognized by the WVU School of Journalism and Media for his feature writing and is a contributing blogger to Connect-Bridgeport. He is also a member of the BHS Quiz Bowl, History Bowl, Science Bowl, Thespians, Inspire WV, National Honor Society and Key Club. Among those who have taken Advanced Placement classes, Pinti ranks as a Merit Scholar and has been featured in the local, state and national theatre performances. 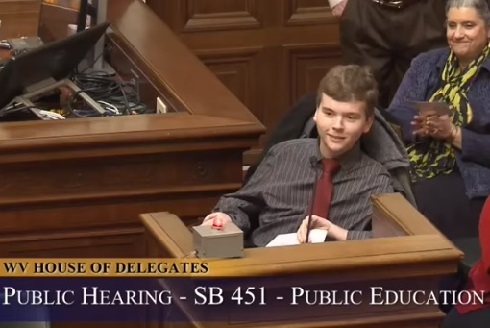 His passion for social justice and educational opportunities for the disabled has allowed him to be the face for so many students who might be affected by the omnibus bill. According to Pinti, he also spoke to honor the teachers and aides who have continually encouraged him throughout school. His parents, Donna Booth and John Pinti, have been pivotal in developing the confident, kind young man that appeared at the capitol Monday. Editor's Note: The video below is from the Senate public hearing Tuesday. The entire video is more than two hours long. You can find Vincent Pinti's presentation go to the 2 hour, 8 minute mark. He speaks shortly after that.